Since I’ve been to New York City several times for business, I thought I’d pass along some tips. If you’re in New York City for a week, I would highly recommend getting a 7-day Unlimited MetroCard ($29). A single ride is $2.50, so just two trips a day makes it worthwhile. If you’re flying into JFK Airport, I recommend taking the AirTrain to Jamaica Station. Once you get to the station, you’ll see a set of fare gates and banks of MetroCard machines on either side. You’ll need to get a $5 MetroCard just to leave the AirTrain system, so you’ll have to buy that before the fare gates. But you can’t buy a 7-day Unlimited MetroCard at either of those banks of machines. Instead, proceed to the subway station at Jamaica (which, by the way, is called Sutphin Boulevard–Archer Avenue–JFK Airport, not Jamaica) and buy a 7-day card at its machines. From there, you can take the subway (E line) all the way into Manhattan. It will take about an hour. If you want to spend a bit more money to save time, you can also take the Long Island Rail Road from Jamaica to Penn Station in Manhattan, which takes 30 minutes. If it’s the weekend, buy a CityTicket for the LIRR, which only costs $3.75 (a regular ticket is $8.75, off-peak $6.25). You can buy LIRR tickets at the ticket machines before the fare gates at Jamaica. Now that oil has fallen to half of what it was in the summer, we should the gas tax should be raised now, while gas is still cheap. The federal gas tax was last raised in 1993, and California’s state gas tax was last raised in 1994. In California, we would need to raise gas taxes by 18 cents per gallon just to keep up with inflation. It should probably be hiked a lot more. And with a higher tax, the price at the pump would not swing around so much; gas prices in Europe showed much less volatility than here. A few months ago, the Wall Street Journal ran a feature article on Lee Myung-Bak, the then-presidential candidate (and now president) of South Korea. As an aside, the article said that as mayor of Seoul, Lee had ordered an elevated highway torn down to unearth a buried stream and turn it into a park. Of course, I couldn’t let that pass without doing more background reading. While reading up on Cheonggyecheon, I remembered that Taipei had a similar situation. After more research, I found out that Xinsheng Road follows the path of an old canal, and that when he was mayor of Taipei, Ma Ying-jeou also proposed daylighting the canal (although not the part that’s under the elevated Xinsheng Expressway). And now Ma is running for president of Taiwan! In east Asia, tearing down roads is becoming the clear path to launching your presidential career. Michael Wallis, author of The Lincoln Highway: Coast to Coast from Times Square to the Golden Gate, was featured on the Colbert Report! That’s more than a million people who now know what the Lincoln Highway is. After work today, I made my way up to Book Passage in San Francisco’s Ferry Building to catch the endpoint of the tour for the new book, The Lincoln Highway: Coast to Coast from Times Square to the Golden Gate, by Michael Wallis and Michael Williamson. 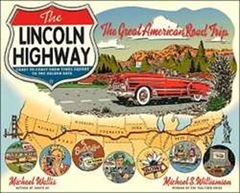 The Lincoln Highway was the first road across America, yet lately it has languished while Route 66 gets the glory. However, just as Mr. Wallis’ 1992 book, Route 66: The Mother Road, helped revive national interest in that historic highway, I’m hopeful that the Michaels’ new book will spark new life in the “Father Road.” Already, it’s gotten huge press, from the New York Times to KCBS AM. They’re even going to be on The Colbert Report, and Bill O’Reilly has also expressed interest in interviewing them. I asked the authors why they decided to write a book on the Lincoln Highway — hadn’t Wallis already covered similar ground with Route 66? Mr. Wallis said he was “tired of the Lincoln Highway being referred to in the past tense.” Mr. Williamson said that lots of people have traveled Route 66, and now they want something different. The Lincoln Highway provides that opportunity. 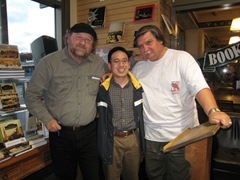 I’ve posted my photos of the book tour in my Flickr account, including my photo with the authors, when Michael Wallis told me I was “the safest man in San Francisco” at that time. By the way, for dinner I went to Mistral Rotisserie Provençale in the Ferry Building and got a ¼ roast chicken with broccoli and potatoes for $7.75. Not super cheap, but well worth it. On Thursday night I saw a documentary on the History Channel on Bolivia’s Yungas Road, also known as the “Road of Death.” It’s a major transportation route running northeast from the capital city of La Paz, but the most dangerous section is gravel, only ten feet wide, with steep dropoffs of over 1000 feet and no guardrails, and grades up to 14%, twice as steep as the maximum grade for interstate highways. Over 200 travelers die every year on this road. It’s completely insane. The photos must be seen to be believed. I saw Cars over the weekend with Jon. Cars, of course, is based on a true story: the life, death, and rebirth of Route 66. It was astonishingly accurate in its renditions of roads, road signs, and maps. Pixar definitely had some roadgeeks advising them. In addition, Pixar got the author of one of the most celebrated books on Route 66, Michael Wallis, to be the voice of the Sheriff, which explains how the movie could tell the story of Route 66 and roadside America was so well. It also explains some of the dewy-eyed nostalgia in the film, but that’s okay. Cars is a family film, not a PBS documentary. Afterwards, we went to Willow Glen for dinner. Aqui is a “fast casual” Cal-Mex restaurant [photo]. It’s definitely got the “Cal” part going; I’ve never been to a Mexican place that serves tortilla chips with black beans, hummus, and polenta. Their Pork Ranchero Tamales and Cuban Pork Enchiladas were also tasty. And since they don’t have waiters, none of their dishes are above $11. For dessert, we couldn’t resist our third visit to the Willow Glen Frozen Yogurt Company [photo]. Get this: a neighborhood where the streets are for cars and planes. Here’s an overhead view from Windows Live Local. Notice the extra-wide streets named Boeing Road, United Drive, and so on, next to the Cameron Airport. These streets are also taxiways. Both Hong Kong and Taipei have RFID smart cards available for paying fares on subways and buses. Taipei even knocks 20% off of each subway ride. You don’t need to take the card out, just hover your wallet over the reader. It’s amazingly convenient. The Bay Area desperately needs something like this, especially since we have over two dozen transit agencies (which is stupid, but that’s another topic). The Metropolitan Transportation Commission has been testing such a system, TransLink, for almost four years. Let’s go people! What’s the holdup?